Insights in translational cancer research hold the key to the therapeutic progress in oncology. As a new cross-journal article collection on Translational Oncology is launched by BMC Medicine, we reflect on current trends in this field, including tumor heterogeneity, liquid biopsies, and immunotherapy. Translational cancer research has taken giant leaps since appearing in the scientific literature at the beginning of the 21st century. It progressed from identifying a single mutation driving cancer to the high-throughput next-generation whole-genome sequencing analyses. Recent advances in omics have broadened our knowledge of the processes underlying cancer development. In recognition of its importance, we have recently launched a new cross-journal article collection on Translational Oncology, guest edited by Prof Tommaso Dragani. 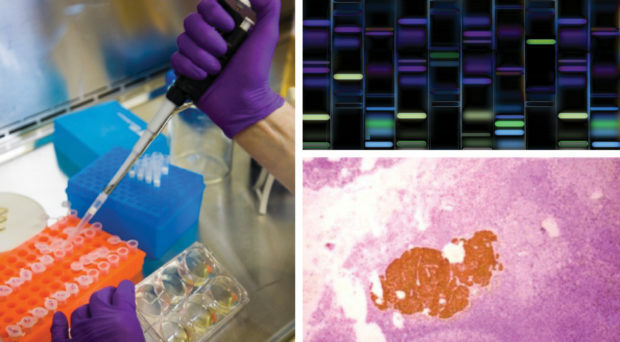 As part of the collection, in a Forum Article, 8 cancer research experts highlight major translational advances in colorectal, ovarian, breast, lung, and prostate cancer research. The complexity of cancer is ever more apparent with every new discovery. Genome-wide association studies have shown that (…) hundreds of genetic variants conspire to determine that risk [of developing cancer]. Reading their short overviews, it’s clear that we need a tailored approach for each cancer type. The point of convergence is aiming for individualized approaches and precision medicine, in other words designing treatments targeting specific alterations that drive tumor development in individual patients. BMC Medicine also recently attended the EACR24 Congress in Manchester and UK Breast Cancer Research Symposium 2016 in London (organized by Breast Cancer Now). Many sessions discussed how basic research contributes to informing clinical decisions in oncology. A key challenge in translational research is tumor heterogeneity. It’s observed at many levels from differences between individuals, differential treatment responses to intratumor heterogeneity. This concept has fuelled studies on cancer mutational signatures, like research from Mike Stratton’s group. The main aim of such genome-driven studies is establishing tumor clusters that hold “clinically applicable information that could impact treatment decisions”. As summarized by Antoni Castells, a number of molecular classification systems have recently been established for colorectal cancer research. J.P. Michiel Sedelaar and Jack A. Schalken emphasized the need for molecular stratification of castration-resistant prostate cancer, which may be soon achieved by next generation sequencing studies. Recently, the work of the METABRIC Consortium resulted in identifying 10 clusters of breast cancer, as highlighted by Helena Earl. This approach is likely to be enhanced with the use of plasma circulating tumor DNA (ctDNA) as repeatable “liquid biopsies”, which facilitates tracking mutations and treatment response. “Liquid biopsies” are important also in lung cancer translational research, as briefly described by Wade T. Iams and Christine M. Lovly. Therapy of lung cancer, beside melanoma, has seen great progress after successful clinical trials of immunotherapeutics. The main challenge is acquired treatment resistance both to immune and molecular-targeted therapy. Understanding the role of immune system in cancer development, as discussed during EACR24 Congress by James P. Allison and Adrian Hayday, may help in overcoming tumor escapes. Apart from treatment response assessment and risk estimation, molecular profiling is useful in cancer screening. Vathany Kulasingam and Eleftherios P. Diamandis have summarized the key advances in ovarian cancer screening. Translational research is crucial in informing clinical practice and trials. Bringing researchers and clinicians together, combining clinical information with basic research findings is the way to move the field forward, find the best solutions and beat cancer. Journal of Experimental and Clinical Cancer Research. The article collection is now accepting submissions of original research articles that provide important developments in cancer research. Preclinical studies should provide a significant advance in knowledge, and have clear potential for strong clinical impact.